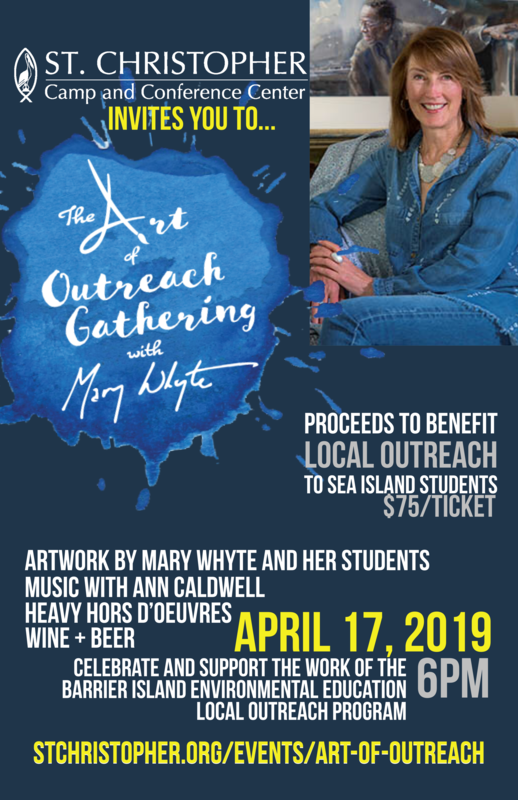 Join Mary Whyte on the night of April 17 for an extraordinary event at St. Christopher on beautiful Seabrook Island! The “Art of Outreach Gathering” will include an incredible display of art created by Mary Whyte and her students, opportunities to learn about our Environmental Education program, tours of our Herpetarium and Aquarium, heavy hors d’oeuvres, beverages including beer and wine, and music by Ann Caldwell. The proceeds of this event will benefit the Barrier Island Outreach Program of St. Christopher and provide scholarships to bring our Local Outreach Program to Title One schools in the Charleston area. Purchase your tickets online here and join us for an exciting evening! Print out your tickets and present them at the event registration table in front of Susanna’s House at Saint Christopher.